I’ve always known that my maternal Grandfather used to make doll moulds for Rosebud but over the last few months I have started to want to find out more and particularly want to own a doll that my Grandfather designed. My Grandfather was Jack Morris. He is in the photograph below standing at the back with dark hair and a large moustache. I remember that moustache! I also remember him working away in his workshop while I played outside. You see we were neighbours, living in two houses at the end of a bumpy lane in the Herefordshire countryside. My Mother is wearing red and I am the little blonde thing to her right being held by my Grandmother. I know I look like a boy but apparently children had short hair in those days! That’s my Dad, far right, behind my Grandmother and my brother is at the front. My Grandfather went to Moseley Art School at the age of eleven and then went on to Birmingham College of Art. Later he was apprenticed to Birmingham Guild where he was taught how to model lettering and medals. Once self employed he continued to work for the Guild, including making patterns for aeroplane parts during the war. After the war he regularly worked for a man called Eric Smith, who took over his father’s business Nene Plastics in 1934. 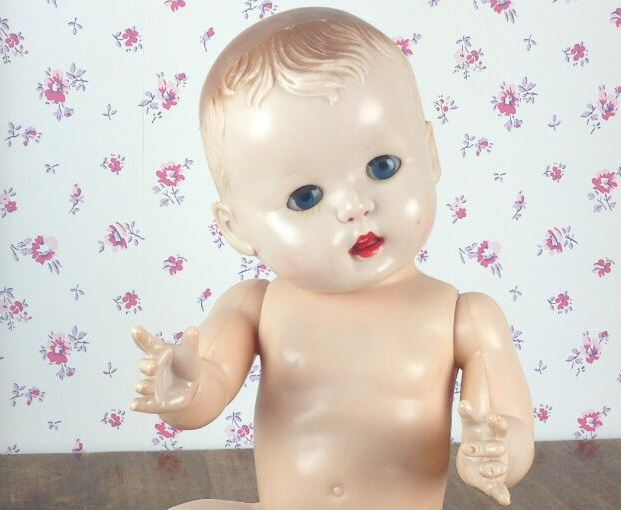 In 1947 Nene Plastics started manufacturing composition dolls in several sizes and registered the trademark ‘Rosebud’. By 1950 hard plastic dolls were being made and the factory began experimenting with vinyl in 1955. I discovered a while ago that Rosebud dolls regularly pop up on eBay but have to admit to not being very successful at winning until last weekend – when I purchased three of them! The ones that no one else wanted! Two have arrived and there is as yet no sign of the third. 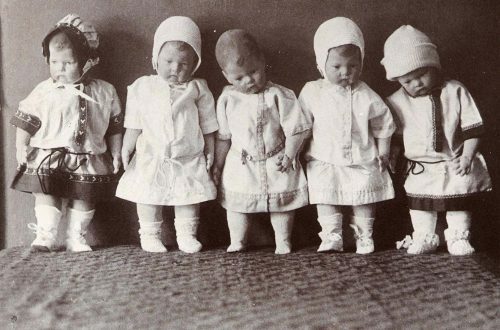 I have since purchased a book from eBay about hard plastic dolls of the 40’s and 50’s and I am hoping this will shed some light on the history of Rosebud dolls and the age of the dolls I have purchased. My mother used to watch her father working and when I started Petalina (well Bambolina as it was then) she enjoyed looking at the various makes of dolls we sold and always commented on the detail of things such as the hands and feet. Her father believed that the dolls he designed should be as realistic as possible and my mother can remember discussions with the owner of Nene Plastics, Eric Smith, about how detailed the hair should or should not be. The first doll I received (above) is really very beautiful. She is a hard plastic doll and the earlier doll of the two. You can see how the doll was constructed from lots of different moulds and where all the pieces join together. Once upon a time I am sure she was quite sturdy but now her limbs and head rattle around in a very noisy manner – not a very cuddly girl at all, but very appealing none the less. She has a pretty face with blue eyes and a rosebud shaped mouth with tiny teeth. Her eyes still open and close but need a little help to open again. Her limbs, hands and feet are very realistic with lots of detail and she sits and moves in a very natural manner. I love the way that her head tilts as well as turns. The curls on the back of her head by her neck are also gorgeous and just like a real baby’s. She also used to have a sound box but that doesn’t work. So when my mother looks at the dolls it is the little details that may help her recognise them but as she says she is now 82 and is was a very long time ago so it could be difficult. Having said that I have sent her emails with all the photos I have taken and she says the doll above looks like my Grandfather’s work. The book I purchased is about British Hard Plastic Dolls of the 1940s and 1950s by Frances Baird. The first thing that hit me was how many different British makes of dolls there used to be but now they have all long gone. Such a shame. Anyway, I am very grateful for the information provided by Frances in the book because it has helped me date my dolls. 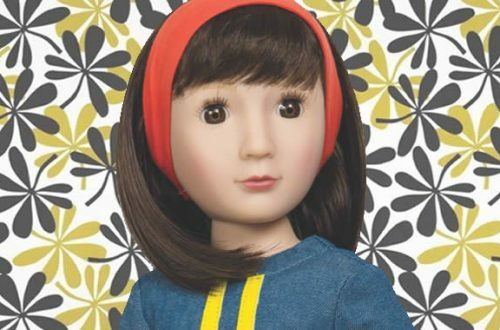 The doll above has a signature Rosebud logo on the back – these were used on dolls manufactured in the 1950s. There is also a picture of my doll stating that she was made sometime in the early to mid 1950s. Rosebud dolls in the 1960s had a slightly different logo on the back – Rosebud was written inside a large keyhole shape with a rose by the ‘R’. The company had moved to a much larger factory and in the mid 1960s it began to amalgamate with Mattel. By 1967 Mattel was in control and from 1970 the name Rosebud was dropped from the Mattel logo. The second doll is a major disappointment. She is in very poor shape and filthy dirty but at least she didn’t cost an arm and a leg! It’s still been interesting to see her anyway despite her condition. The plastic used for her head and limbs is very soft and pliable so is probably vinyl and full of phthalates to soften it. These pieces of the doll have been made using modern techniques of injection moulding or such like and there aren’t any seams. The vinyl has discoloured badly with yellowing on her face, hands and feet. Her body is made from thin hard plastic and the colours don’t match anymore. Clearly this doll has been really loved and played with a great deal. Her prettiest feature I think is her hair which is moulded all over in curls. I also think it was painted dark brown as there are tiny bits of paint remaining in some deep crevices. Her face isn’t particularly nice, not helped by the faded blue eyes, and her mouth is far too small and looks very odd. The keyhole logo on her back confirms that she is a 1960s doll. I’m not sure how the vinyl and plastic used dates her. I know that my Grandfather carried on making moulds until the mid 1960s which is when he retired and it sounds as if this coincided with the arrival of Mattel. I’m really not sure that he would have sculpted this doll as it isn’t his style. I’ll have to see what my mother thinks when she first sees her. If you would like to see a film showing production of Rosebud dolls at the Rosebud Mattell doll factory based in Wellingborough in 1968, click here to go to British Pathe, a collection of 90,000 historic film clips. It’s fascinating! Since the original post went up on our website in March 2013, it has been visited by more people than any other page! It has started many discussions and introduced me to some very passionate people. My Grandfather and these photos have also been featured in an exhibition. I have also been contacted by many people asking for assistance with valuations of Rosebud dolls, and how to go about buying and selling. I’m sorry but this is not where my expertise lies and all I can suggest to everyone is that they look on eBay for prices of dolls that have sold in the past before putting them up for sale on eBay themselves. Below are screen shots of the many comments put on the original site. For speed I have not copied out every single one but there are so many interesting comments it is well worth a browse through. I love how Reg Pearson in September 2017 has let us know that McCarthy & Stone are currently developing a new retirement living scheme on the Rosebud factory site in Wellingborough featured in the film mentioned above. After Rosebud, the site was occupied by several other companies including George Cox Ltd (see carving over the door), before being demolished to make way for the new development which McCarthy & Stone have named Rosebud Court, and Reg wonders how many of the occupants owned Rosebud dolls when they were young? Probably quite a few judging by their popularity at the time. And now, it just so happens that my husband Brendon joined McCarthy & Stone as an MD in the south of England and is very much enjoying his new role with these market leaders. Thank you to Brendon and the team at McCarthy & Stone for providing the photos below of the Rosebud/Cox building and the new development.